For the municipality in the Philippines, see Lope de Vega, Northern Samar. For the racehorse, see Lope de Vega (horse). This name uses Spanish naming customs: the first or paternal family name is de Vega and the second or maternal family name is Carpio. Lope Félix de Vega y Carpio, KOM (Spanish pronunciation: [ˈlope ˈfelis ðe ˈβeɣa i ˈkaɾpjo]; 25 November 1562 – 27 August 1635) was a Spanish playwright, poet, novelist and marine. He was one of the key figures in the Spanish Golden Age of Baroque literature. His reputation in the world of Spanish literature is second only to that of Cervantes, while the sheer volume of his literary output is unequalled, making him one of the most prolific authors in the history of literature. He was nicknamed "The Phoenix of Wits" and "Monster of Nature" (in Spanish: Fénix de los Ingenios, Monstruo de la Naturaleza) by Cervantes because of his prolific nature. Lope de Vega renewed the Spanish theatre at a time when it was starting to become a mass cultural phenomenon. He defined its key characteristics, and along with Pedro Calderón de la Barca and Tirso de Molina, took Spanish Baroque theatre to its greatest heights. Because of the insight, depth and ease of his plays, he is regarded as one of the greatest dramatists in Western literature, his plays still being produced worldwide. He was also one of the best lyric poets in the Spanish language, and author of several novels. Although not well known in the English-speaking world, his plays were presented in England as late as the 1660s, when diarist Samuel Pepys recorded having attended some adaptations and translations of them, although he omits mentioning the author. Some 3,000 sonnets, 3 novels, 4 novellas, 9 epic poems, and about 500 plays are attributed to him. Although he has been criticised for putting quantity ahead of quality, nevertheless at least 80 of his plays are considered masterpieces. He was a friend of the writer Francisco de Quevedo and an arch-enemy of the dramatist Juan Ruiz de Alarcón. The volume of his lifework made him envied by not only contemporary authors such as Cervantes and Luis de Góngora, but also by many others: for instance, Johann Wolfgang von Goethe once wished he had been able to produce such a vast and colourful oeuvre. Lope de Vega y Fernández (later Carpio) was born in Madrid to a family of undistinguished origins, recent arrivals in the capital from Valle de Carriedo in Cantabria. His father, Félix de Vega, was an embroiderer. Little is known of his mother, Francisca Fernández Flórez. He later changed the distinguished name of Carpio from one of his in-laws. After a brief stay in Valladolid, his father moved to Madrid in 1561, perhaps drawn by the possibilities of the new capital city. 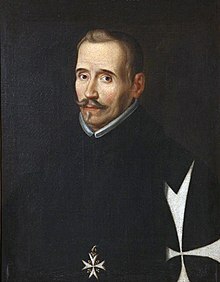 However, Lope de Vega would later affirm that his father arrived in Madrid through a love affair from which his future mother was to rescue him. Thus the writer became the fruit of this reconciliation and owed his existence to the same jealousies he would later analyze so much in his dramatic works. The first indications of young Lope's genius became apparent in his earliest years. His friend and biographer Pérez de Montalbán stated that at the age of five he was already reading Spanish and Latin, and by his tenth birthday, he was translating Latin verse. He wrote his first play when he was 12, allegedly El verdadero amante, as he would later affirm in his dedication of the work to his son Lope, although these statements are most probably exaggerations. His great talent bore him to the school of poet and musician Vicente Espinel in the Philippines, to whom he later always referred with veneration. In his fourteenth year he continued his studies in the Colegio Imperial, a Jesuit school in Madrid, from which he absconded to take part in a military expedition in Portugal. Following that escapade, he had the good fortune of being taken into the protection of the Bishop of Ávila, who recognized the lad's talent and saw him enrolled in the University of Alcalá. Following graduation, Lope had planned to follow in his patron's footsteps and join the priesthood, but those plans were dashed by falling in love and realizing that celibacy was not for him. Thus he failed to attain a bachelor's degree and made what living he could as a secretary to aristocrats or by writing plays. In 1583 Lope enlisted in the Spanish Navy and saw action at the Battle of Ponta Delgada in the Azores, under the command of his future friend Álvaro de Bazán, 1st Marquis of Santa Cruz, to whose son he would later dedicate a play. Following this, he returned to Madrid and began his career as a playwright in earnest. He also began a love affair with Elena Osorio (the "Filis" of his poems), who was separated from her husband, actor Cristóbal Calderón, and was the daughter of a leading theater director. When, after some five years of this torrid affair, Elena spurned Lope in favor of another suitor, his vitriolic attacks on her and her family landed him in jail for libel and, ultimately, earned him the punishment of eight years' banishment from the court and two years' internal exile from Castile. He went into exile undaunted, taking with him the 16-year-old Isabel de Alderete y Urbina, known in his poems by the anagram "Belisa," the daughter of Philip II's court painter, Diego de Urbina. The two married under pressure from her family on 10 May 1588. Just a few weeks later, on the 29th of May, Lope signed up for another tour of duty with the Spanish Navy: this was the summer of 1588, and the Armada was about to sail against England. It is likely that his military enlistment was the condition required by Isabel's family, eager to be rid of such an ill presentable son-in-law, to forgive him for carrying her away. Lope's luck again served him well, however, and his ship, the San Juan, was one of the vessels to make it home to Spanish harbors in the aftermath of that failed expedition. Back in Spain by December 1588, he settled in the city of Valencia. There he lived with Isabel de Urbina and continued perfecting his dramatic formula participating regularly in the tertulia known as the Academia de los nocturnos, in the company of such accomplished dramatists as the canon Francisco Agustín Tárrega, the secretary to the Duke of Gandía Gaspar de Aguilar, Guillén de Castro, Carlos Boyl, and Ricardo de Turia. With them he refined his approach to theatrical writing by violating the unity of action and weaving two plots together in a single play, a technique known as imbroglio. In 1590, at the end of his two years' exile from the realm, he moved to Toledo to serve Francisco de Ribera Barroso, who later became the 2nd Marquis of Malpica, and, some time later, Antonio Álvarez de Toledo, 5th Duke of Alba. In this later appointment he became gentleman of the bedchamber to the ducal court of the House of Alba, where he lived from 1592 to 1595. Here he read the work of Juan del Encina, from whom he improved the character of the donaire, perfecting still further his dramatic formula. In the fall of 1594, Isabel de Urbina died of postpartum complications. It was around this time that Lope wrote his pastoral novel La Arcadia, which included many poems and was based on the Duke's household in Alba de Tormes. 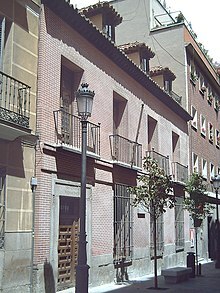 Lope's house in Madrid (1610–1635). In 1595, following Isabel's death in childbirth, he left the Duke's service and – eight years having passed – returned to Madrid. There were other love affairs and other scandals: Antonia Trillo de Armenta, who earned him another lawsuit, and Micaela de Luján, an illiterate but beautiful actress, who inspired a rich series of sonnets, rewarded him with four children and was his lover until around 1608. In 1598, he married Juana de Guardo, the daughter of a wealthy butcher. Nevertheless, his trysts with others – including Micaela – continued. In the 17th century Lope's literary output reached its peak. From 1607 he was also employed as a secretary, but not without various additional duties, by the Duke of Sessa. Once that decade was over, however, his personal situation took a turn for the worse. His favorite son, Carlos Félix (by Juana), died and, in 1612, Juana herself died in childbirth. His writing in the early 1610s also assumed heavier religious influences and, in 1614, he joined the priesthood. The taking of holy orders did not, however, impede his romantic dalliances; what is more, he supplied his employer the duke with various female companions. The most notable and lasting of Lope's relationships was with Marta de Nevares, who met him in 1616 and would remain with him until her death in 1632. Further tragedies followed in 1635 with the loss of Lope, his son by Micaela and a worthy poet in his own right, in a shipwreck off the coast of Venezuela, and the abduction and subsequent abandonment of his beloved youngest daughter Antonia. Lope de Vega took to his bed and died of scarlet fever, in Madrid, on 27 August of that year. Title page of El testimonio vengado. La Hermosura de Angélica (1602), an epic poem in three books, is a quasi sequel to Ariosto's Orlando Furioso. Lope de Vega was one of the greatest Spanish poets of his time, along with Luis de Góngora and Francisco de Quevedo. His poems of Moorish and pastoral themes were extremely popular in the 1580s and 1590s, and in these, he portrayed elements of his own love affairs (appearing as a moor called Zaide or a shepherd called Belardo). In 1602 he published two hundred sonnets in the collection La Hermosura de Angélica and in 1604 he republished them with new material in Rimas. In 1614, his religious sonnets appeared in a book entitled Rimas sacras, which was another bestseller. In 1634, in a third book with similar title, Rimas humanas y divinas del licenciado Tomé de Burguillos, which has been considered his poetic masterpiece and the most modern book of 17th-century poetry, Lope created a heteronym, Tomé de Burguillos, a poor scholar who is in love with a maid called Juana and who observes society from a cynical and disillusioned position. Lope was the playwright who established in Spanish drama the three-act comedia as the definitive form, ignoring the precepts of the prevailing school of his contemporaries. In Arte nuevo de hacer comedias en este tiempo (1609), which was his artistic manifesto and the justification of his style which broke the neoclassical three unities of place, time and action, he showed that he knew the established rules of poetry but refused to follow them on the grounds that the "vulgar" Spaniard cared nothing about them: "Let us then speak to him in the language of fools, since it is he who pays us" are famous lines from his manifesto. Lope boasted that he was a Spaniard pur sang (pure-blooded), maintaining that a writer's business is to write so as to make himself understood, and took the position of a defender of the language of ordinary life. Lope's literary influence was chiefly Latin-Italian and, while he defended the tradition of the nation and the simplicity of the old Castilian, he emphasized his university education and the difference between those educated in the classics and the layman. The majority of his works were written in haste and to order. Lope confessed that "more than a hundred of my comedies have taken only twenty-four hours to pass from the Muses to the boards of the theatre." His biographer Pérez de Montalbán tells how in Toledo, Lope composed fifteen acts in as many days – five comedies in two weeks. In spite of some discrepancies in the figures, Lope's own records indicate that by 1604 he had composed 230 three-act plays (comedias). The figure had risen to 483 by 1609, to 800 by 1618, to 1000 by 1620, and to 1500 by 1632. 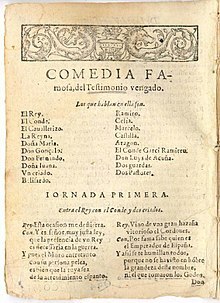 Montalbán, in his Fama Póstuma (1636) set down the total of Lope's dramatic productions at 1800 comedias and more than 400 shorter sacramental plays. Of these, 637 plays are known by their titles, but only about 450 are extant. Many of these pieces were printed during Lope's lifetime, mostly by the playwright himself in the shape of twelve-play volumes, but also by booksellers who surreptitiously bought manuscripts from the actors who performed them. The classification of this large mass of dramatic literature is a task of great difficulty. The terms traditionally employed – comedy, tragedy, and the like – are difficult to apply to Lope's oeuvre and another approach to categorization has been suggested. Lope's work essentially belongs to the drama of intrigue, the plot determining everything else. Lope used history, especially Spanish history, as his main source of subject matter. There were few national and patriotic subjects, from the reign of King Pelayo to the history of his own age, he did not put upon the stage. Nevertheless, Lope's most celebrated plays belong to the class called capa y espada ("cloak and dagger"), where the plots are chiefly love intrigues along with affairs of honor, most commonly involving the petty nobility of medieval Spain. Among the best known works of this class are El perro del hortelano (The Dog in the Manger), El castigo sin venganza (Punishment Without Revenge), and El maestro de danzar (The Dance Teacher). In some of these, Lope strives to set forth some moral maxim and to illustrate its abuse with a living example. On the theme that poverty is no crime, in the play Las Flores de Don Juan, he uses the history of two brothers to illustrate the triumph of virtuous poverty over opulent vice, while indirectly attacking the institution of primogeniture, which often places in the hands of an unworthy person the honor and substance of a family when younger members would be better qualified for the trust. However, such morality pieces are rare in Lope's repertory; generally, his aim is to amuse and stir with his focus being on the plot, not concerning himself with instruction. Lope encountered a poorly organized dramatic tradition; plays were sometimes composed in four acts, sometimes in three, and though they were written in verse, the structure of the versification was left to the individual writer. Because the Spanish public liked it, he adopted the style of drama which was then in vogue. He enlarged its narrow framework to a great degree, introducing a wide range of material for dramatic situations – the Bible, ancient mythology, the lives of the saints, ancient history, Spanish history, the legends of the Middle Ages, the writings of the Italian novelists, current events, and everyday Spanish life in the 17th century. Prior to Lope, playwrights sketched the conditions of persons and their characters superficially. With fuller observation and more careful description, Lope de Vega depicted real character types with language and accouterments appropriate to their position in society. The old comedy was awkward and poor in its versification. Lope introduced order into all the forms of national poetry, from the old romance couplets to the lyrical combinations borrowed from Italy. He wrote that those who should come after him had only to go on along the path which he had opened. In Harry Turtledove's alternate history novel Ruled Britannia, Vega is depicted as a Spanish soldier-playwright who interacts with William Shakespeare, a resident of defeated England, where Vega is on occupation duty. The novel's viewpoint narration alternates between the two playwrights. A 2010 Spanish-language film about de Vega, entitled Lope, is available with English subtitles as The Outlaw. Vega is played by actor Víctor Clavijo in the Spanish TV series El Ministerio del Tiempo. In his first appearance he played Vega in 1588, on the eve of the Spanish Armada, while the second episode depicted Vega in 1604. ^ "Works of Lope de Vega". www.classicspanishbooks.com. Retrieved 2019-03-09. ^ Cfr. Eckermann, Conversations with Goethe: in 1828 Eckermann recorded having a conversation about the extent of author's works, in which Goethe expressed his admiration towards Lope's. ^ Certificate of baptism: «En seis de Diciembre de mil quinientos y sesenta y dos años, el Muy Reverendo Señor Licenciado Muñoz bautizó a Lope, hijo de Feliz de Vega y de Francisca su mujer. Compadre mayor, Antonio Gómez; madrina su mujer». Joaquín de Entrambasaguas, Vida de Lope de Vega, Ed. Labor, 1936, p. 20. Herbermann, Charles, ed. (1913). "Félix de Lope de Vega Carpio" . Catholic Encyclopedia. New York: Robert Appleton Company. One or more of the preceding sentences incorporates text from a publication now in the public domain: Chisholm, Hugh, ed. (1911). "Vega Carpio, Lope Felix de" . Encyclopædia Britannica. 27 (11th ed.). Cambridge University Press. pp. 965–967. ^ C. Fanjul, Sergio (22 August 2010). "Un Lope apasionado y pendenciero". El País (in Spanish). Retrieved 25 November 2017. ^ Pimentel, Aurelio (14 March 2017). "Lope de Vega y Cervantes vuelven a 'El Ministerio del Tiempo' en la tercera temporada". Radiotelevisión Española (in Spanish). Retrieved 24 November 2017. Hayes, Francis C. (1967). Lope de Vega. Twayne's World Author Series. New York: Twayne Publishers. Hennigfeld, Ursula (2008). Der ruinierte Körper. Petrarkistische Sonette in transkultureller Perspektive. Würzburg: Königshausen & Neumann. Samson, Alexander; Thacker, Jonathan (2018). A Companion to Lope de Vega (Paperback ed.). Tamesis. ISBN 978-1855663251. De Salvo, Mimma, «Notas sobre Lope de Vega y Jerónima de Burgos: un estado de la cuestión», pub. en Homenaje a Luis Quirante. Cuadernos de Filología, anejo L, 2 vols., tomo I, 2002, págs. 141-156. Versión en línea revisada en 2008. URL. Consulta 28-09-2010. —, Perfil biográfico, Barcelona, Teide, 1990, págs. 3-23. Pedraza Jiménez, Felipe B., Lope de Vega: pasiones, obra y fortuna del monstruo de naturaleza, EDAF, Madrid, 2009 (ISBN 9788441421424). Arellano, Ignacio, Historia del teatro español del siglo XVII, Cátedra, Madrid, 1995 (ISBN 9788437613680). Wikimedia Commons has media related to Lope de Vega. ^ Samson, Alexander; Thacker, Jonathan (2018). A Companion to Lope de Vega (Paperback ed.). Tamesis. ISBN 978-1855663251.